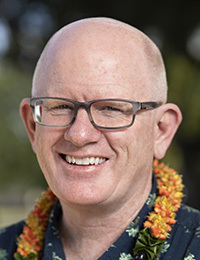 Tim Dolan joined the University of Hawaiʻi on February 1, 2019, as vice president of advancement and chief executive officer of the UH Foundation. He is responsible for increasing fundraising totals and launching the university’s next comprehensive campaign. He is also charged with continuing to enhance the collaborative relationship between UH Foundation and the university with a focus on alumni relations and development. Dolan previously served as vice principal of advancement at the University of Sydney, leading that university’s historic $1 billion campaign. Earlier in his career, Dolan served as director of development at UH’s John A. Burns School of Medicine and UH Cancer Center, and also worked at Chaminade University. Prior to the University of Sydney and after leaving Hawaiʻi, Dolan spent nearly seven years at UCLA providing fundraising leadership for the division of humanities before overseeing development for the College of Letters and Science and directing the university-wide leadership gift program. Dolan is a former chair of Australia’s G08 Advancement Group. He earned a bachelor’s degree in political science at UCLA.